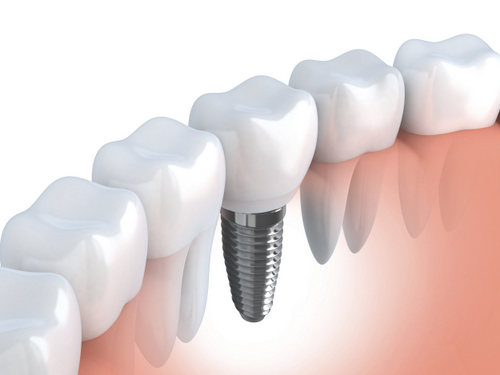 A dental implant is a titanium post designed to replace missing teeth. The post is surgically placed into the jawbone where the tooth is missing, and provides a more permanent solution. Crowns and conventional bridges or dentures may not be your only options when replacing missing teeth. For some people, dental implants offer a smile that looks and feels very natural. Throughout a series of appointments, the implants are surgically attached below the gum line to the jawbone. Since the implants are being fused to your bone, a process called osseointegration, the implants offer stability. Integration of the implants into your jaw also helps your replacement teeth feel more natural. Some people also find the secure fit more comfortable than conventional substitutes. Candidates for dental implants must have healthy gums and adequate bone to support the implant. The gum tissue is opened to expose the bone area where the implant will be placed. In situations where there is insufficient bone structure, bone grafting may be a recommended procedure. Once healthy bone has been established, a special drill is used to prepare the bone to receive the implant. After the bone has been prepared, the implant is placed and the tissue is sutured. After seven to ten days the sutures are removed. The healing process takes three to six months, the amount of time it usually takes the implant to become part of the bone of the jaw. When the gum tissue is ready, a special post is attached to the implant; it is the support for the new porcelain crown. Today's technologies often include zirconium abutments attached to the implant post, to assure that the new porcelain tooth possesses translucency properties similar to a natural tooth. After impressions are taken a crown is made and shaded to match your existing teeth. The crown is then slipped over the post and cemented. This final prosthetic crown appears as a natural tooth. There is a high rate of failure of implants in patients who smoke, so dental implants tend to not be an option for patients who are actively smoking. We will help you determine whether dental implants will be a good tooth replacement option for you. Proper brushing and flossing will maximize the longevity of your new dental implant.